The story below were supplied by Harold’s son Jim. “The Junior in the subject picture is NX11804, serial no. 1182, manufactured 06-10-1931. 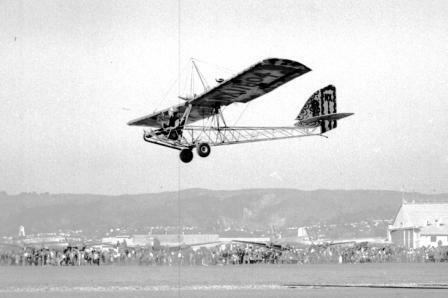 The photograph was taken in connection with the All-American Air Maneuvers held in Miami, Florida on January 10-12, 1947 where the “1910 Curtiss Pusher” comedy act was part of the show. 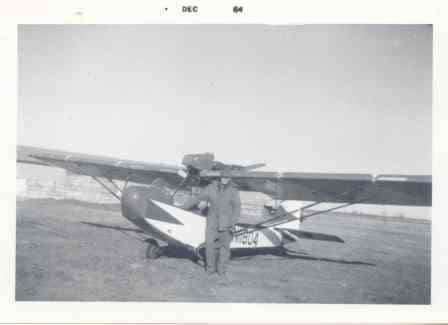 Harold Ladwig bought the plane from John Smaagaard on 08-14-1941. Smaagaard, of Madison, MN had owned it since 12-20-1939, according to a chain of title for s/n 1182 dated 10-09-1962. From 1932 through 1939 it had various owners in Oklahoma and Kansas. 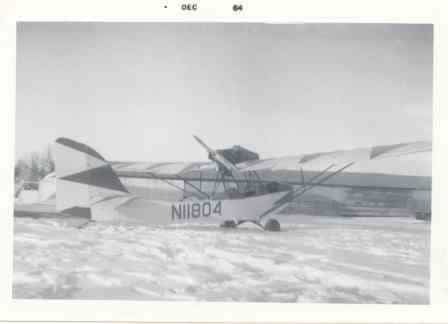 Harold Ladwig had previously owned CW-1 C634V in 1938, flying it from small airports south of Minneapolis and north of the Minnesota River in the suburb of Bloomington. When C634V had a forced landing in “the asparagus patch”, a Minneapolis newspaper ran a photo of it in an article about a meeting of Bloomington residents to protest operation of planes from the privately-operated airport. Unaware of the design of the landing gear, the article declared that the landing gear had been “washed out” in the crash. Harold Ladwig was not the pilot. Harold Ladwig flew NC11804 for a few months in 1941, then disassembled and stored it for the duration of WWII. In November of 1941 he took his sons Jim and Bud Ladwig on a flight over their grandmother’s home on the south edge of downtown Minneapolis – squeezing both into the front seat of The Pusher, as it was known by family and friends.. I (Jim) remember we flew up to 5000 feet. Recently (in 2012) I calculated that had the Szekely engine failed we could have glided to unpopulated areas, now heavily settled, just over four miles away at the time. The modifications consisted mainly of stripping the fuselage of covering and all fairings. Since the wing fabric was “tired”, family and friends were involved in covering the wings and tail surfaces. Jim and Bud and their same-age cousins, Russ and Don Hanson, learned how to stitch ribs and observed many other tasks. Jim got to brush the numbers onto the rudder, since a “primitive” appearance was desired. The wing numbers were applied with a single stroke of the spray gun, no masking was done. Many parts, later considered valuable, were discarded. 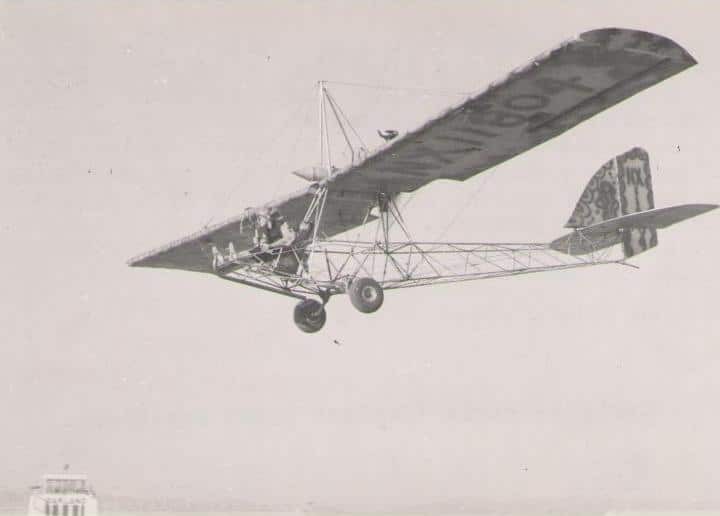 The nose bowl, the instruments and panel and items from the rear cockpit were among them, as was the fuselage “bird cage” tubing. “Harold Ladwig sold the airplane to Jack Huber, the show’s parachute jumper, on 08-08-1947. In that year, the airplane and trailer, towed by a 1933 Plymouth coupe, known in the family as “The Jeep”, travelled a distance of 25,000 miles, equivalent to a trip around the earth. Title to the airplane was transferred to William A. “Bill” Sweet, Jr. on 02-21-1950. Bill was the airshow “talker” for World Air Shows in 1947 and later the owner of and “talker” for National Air Shows. At one point the wing struts were replaced with a kingpost and flying and landing wires. The plane still had the Szekely engine at this time. 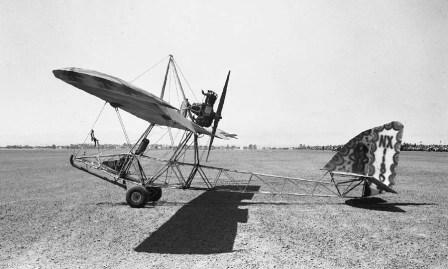 After the trailer and the plane rolled into a ditch, the wings were replaced with modified Cub wings and struts. 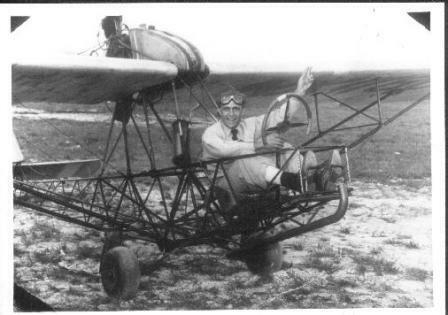 The 55 hp Franklin engine from that same Cub was installed as a replacement for the Szekely and the Cub wheels, tires and brakes installed..
Verbal tales have Bill Sweet selling the airplane and trailer to a dentist, who donated it to the aviation department of the Ohio State University. 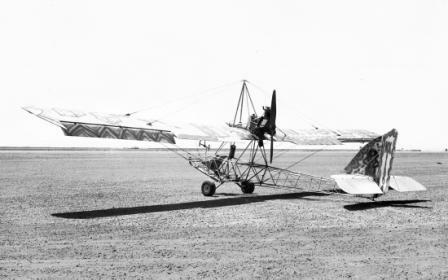 When the aviation students were found to be occasionally assembling the airplane and flying it, the university sold it to a mechanic on the field. He later sold it to a crop duster in northern Minnesota, where Jim Ladwig visited it in the early 1960s. Fabric covering was added over simplified fuselage fairings, and a nosebowl was made from a metal dishpan. A third wing strut was added to the existing rear fitting, converting the Piper “V” struts to “N” struts. There was a plan to affix a shotgun to the nose. Coyotes and foxes were to be gunned down by pointing the plane’s nose at them and firing the shotgun via a push-button switch on top of the control stick. This installation never happened, fortunately.